Recently, I happened onto Mr. Mercedes, the story of a retired detective whose life is saved when he is challenged to solve a crime. The characters were quirky and clever, and no one's villains can match King's. In the recent novel Finders Keepers, the detective Bill Hodges is back--but not until halfway through the book. 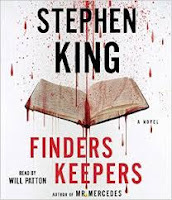 King returns to the same town, with protagonist Pete Saubers, whose father was injured int he crime solved in Mr. Mercedes. The villain in this novel Morris Bellamy has much in common with Pete, particularly a shared obsession with author John Rothstein, a Salinger-type writer who hasn't published since the sixties--but has keep writing, filling moleskin notebooks. King builds a suspenseful story by moving back and forth between Morris and Pete, but when Hodges and his unlikely helpers, Jerome and Holly, from the earlier novel, I couldn't help feeling as if I were having a visit from old friends. What sets King's works apart from some other prolific writers of suspense novels is the intellectual intrigue. He manages to weave in literary allusions deeper than a simple Wikipedia entry. In doing so, he does more than simple name-dropping. Obviously, with all the time he spends writing, he is also reading voraciously--or he has excellent recall of everything he ever read or studied. With the final pages of the novel, King accomplish one more achievement: He makes me wonder when he'll be releasing his next novel with Hodges as a character. 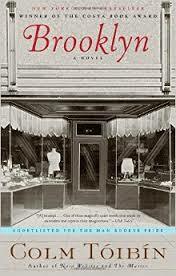 When I saw the trailers for Brooklyn, the movie based on Colm Toibin's novel, I realized that I had the book already, and it had come highly recommended by one of those readers I trust without questions. Since I was at the time trying to decide what to read next, I was fortunate to have the book ready to read. Having recently read Colum McCann's Transatlantic, another book whose plot moved back and forth between Ireland and American, I was in the mood for this story. The main character, Eilis, lives with her widowed mother and her beautiful unmarried sister Rose, a golfer. Their brothers have left for work years ago. Eilis has a job working in a store where her mother never shops, prices higher than their usual establishment. The business is run by a domineering owner who makes sharp distinctions between how she treats her customers of different social status, and she takes advantage of Eilis, who is glad to be able to help her mother financially. Her sister Rose arranges with an Irish Catholic priest from the area, home from America for a visit, to find a job for Rose at an Italian-owned department store and a room in a boarding house for girls. In Eilis, Toibin creates an intriguing protagonist, self aware but practical. She meets Tony, an Italian boy, at a dance thrown by Father Flood, and although he obviously falls for her hard and fast, she thinks her way through the relationship. At the same time, after surviving the first throes of homesickness, she begins to resume her bookkeeping studies, hoping for advancement at the store when she has found employment. Called home after a family tragedy, Toibin dramatizes the internal conflict as Eilis begins to see herself as two people--the independent girl living and working and falling in love in America and the Irish Catholic daughter, with a new air or sophistication upon her return home, attracting attention she had missed in her youth. Toibin avoids turning this into a cookie cutter story primarily through his characterization of Eilis, especially her awareness of her own changes. The author manages to achieve a perfect balance of suspenseful tension and surprise. Labels: Colm Toibin, immigrant fiction, Ireland, New York, reading, TransAtlantic. This weekend holds the promise of time to catch up on my reading posts. I've certainly had a delightful time reading so far this fall. Today though, as part of the celebration of Lenoir-Rhyne's 125th anniversary, I received another good list, "125 Books Every College Student Should Read." It's important to consider that (1. this is a list compiled by just a few people and (2. these same people could probably come up with a different list tomorrow in response to the same question. I can't help going through a book list though, marking the one's I've read. I considered color-coding my highlights: books I've read but do not recall at all; books I've read over and over and over again; books I will never forget; books I have taught over and over and over again; in invisible ink: books I'm embarrassed to admit I haven't read yet. Even with inclusion of 125 books, there is room for debate--why this one and not that one? Where, for example, is Ernest Gaines' A Lesson Before Dying? In my opinion, everyone capable of reading should read that one. If I spend ten minutes glimpsing at my bookshelves, the list would grow unwieldy. That's what I enjoy best: the chance to talk about books, to weigh their merits, to consider the concept of books that anyone should read. I haven't clicked the link to the full recommendations, but I imagine that would add another dimension to the discussion.